"Self-guided, full support river running and white water rafting adventures: safe shuttle services, full or partial support river trips available, and complete, delicious meals are prepared. Whitewater river trips include: Gate of Lodore, Lower Yampa River, Desolation Canyon, Gray Canyon and White River. 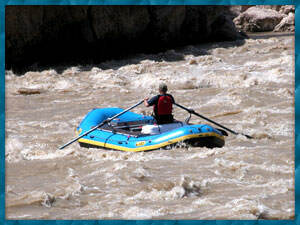 We rent river equipment that is of the highest quality, including Aire and NRS inflatable kayaks." You can experience the thrill of rugged whitewater rapids and the calm of a lazy float on a gentle, soothing current. Enjoy the finest menu choices, special diets, or your own prepared meals. Whatever your preferences, we tailor our services to create the river trip you want. At River Runners' Transport, Inc, located near the famous Green River and Yampa River in eastern Utah and western Colorado, we provide custom rental and shuttle services to river runners. Forget the hassle and headache of packing your equipment, gear, food, and supplies, and then jamming it into your vehicle for a long, cramped drive. Packing and unpacking, loading and unloading can practically be eliminated on your river adventure. Let us do the hard part! We can supply what you need, starting with the boats and hassle-free food packing, right down to the band aids. RIVER EQUIPMENT: top of the line, cleaned & maintained after each outing. RIVER SHUTTLE SERVICES: using reliable drivers with good driving records. Shuttle services to any location within one days' travel. FULL SUPPORT RIVER TRIPS: step out of your cars and into our boats! RIVER ADVENTURES OF A LIFETIME: experience river running most people only dream of. ABOUT US: find out who we are, how we got started, and what we love. While we do provide your river equipment and shuttle needs from A to Z, we do not offer guide services or secure necessary river running permits for you. We will direct you in these areas if you do need assistance.